prides itself with an atmosphere of simple comfort and easy going familiarity. Next door to Slane Castle the Hostel and Cottages are an ideal base for exploring the many wonders of the Boyne Valley including Newgrange, Tara, Kells, Battle of Boyne . Guests have a choice of private rooms, dormitories ,or the 4****self catering cottages. 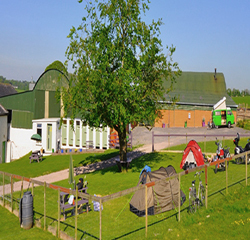 If you would like to camp at Slane Farm then get in touch with us to make a booking. This working farm is run by Joanne and Paddy Macken and their family who will do their utmost to make your stay an enjoyable one. Make an enquiry directly to SLANE FARM HOSTEL AND COTTAGES by completing the form below.